The 2017 re-adaptation of the classic horror novel IT was a huge success. 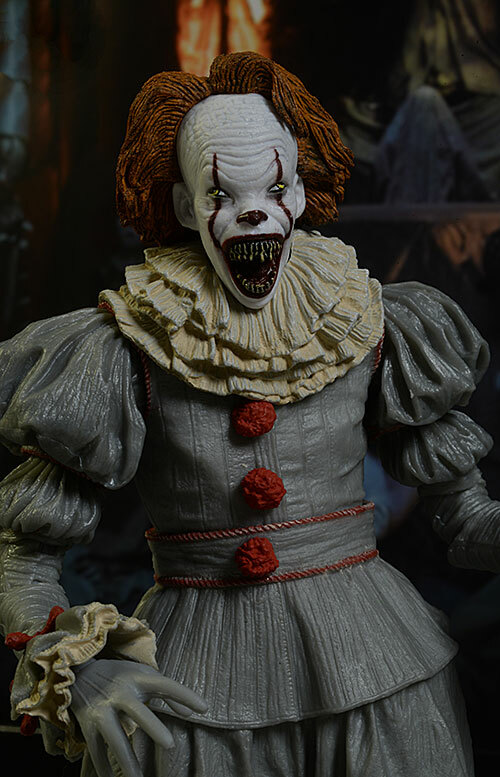 The clown, Pennywise, quickly became the modern face of fear, and collectibles were inevitable. 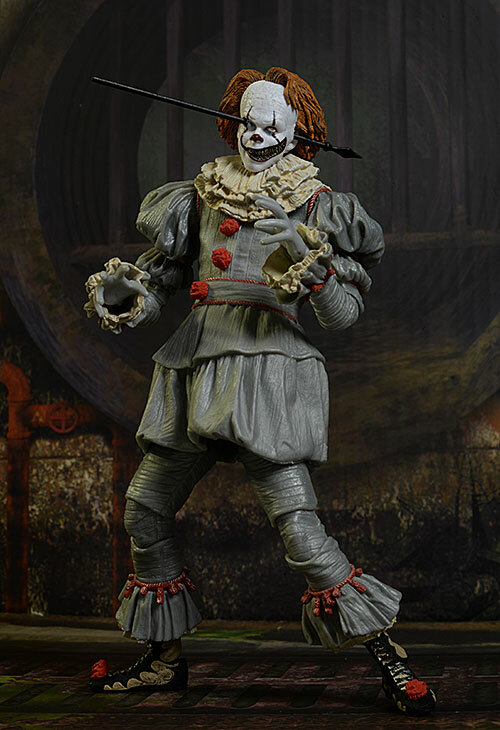 NECA jumped on the license, and we are now getting our third 7" action figure from them. 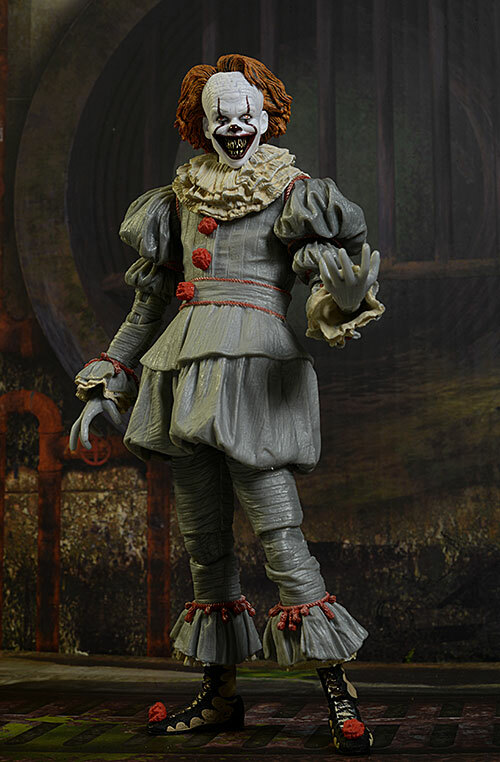 The first was the con exclusive of course, and they did a 'deluxe' regular release. Today we'll be checking out the "Well House" version, with new accessories. 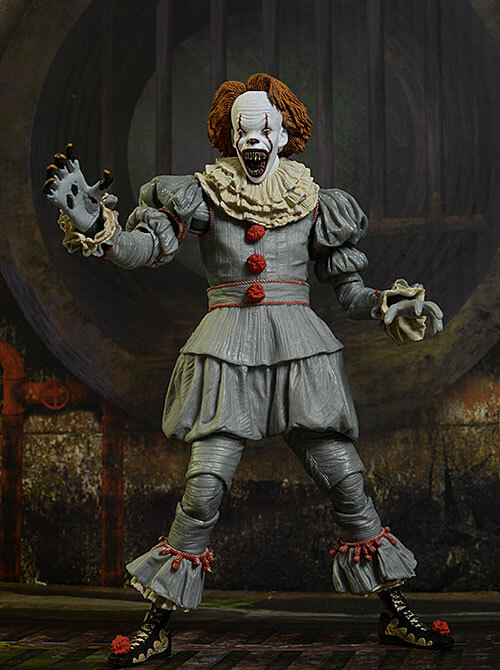 There's at least one more on it's way ("Dancing Clown"), but that's just in this scale. 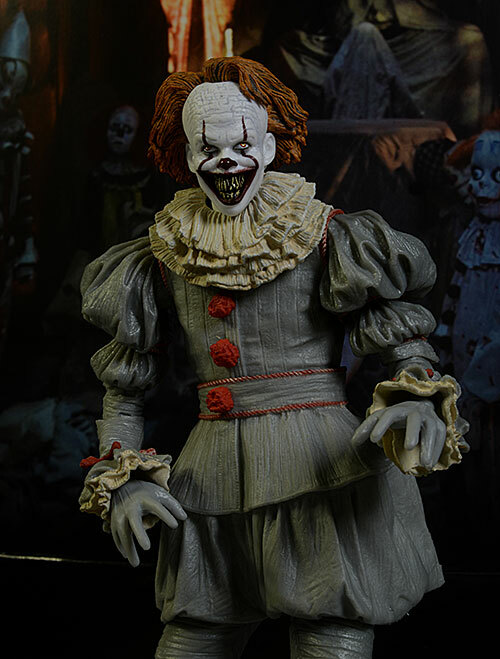 We know they'll be releasing a quarter scale version and an 8" cloth outfit version, and other companies will be doing sixth scale. This guy just started shipping, and will run you around $30 at most retailers. 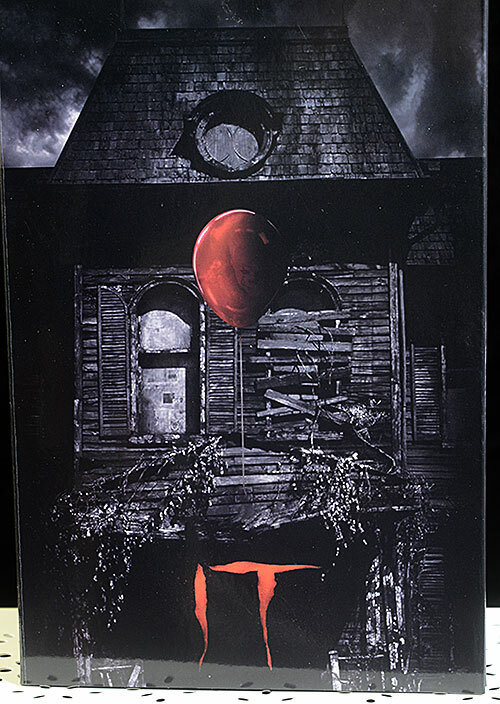 The boxes look great, with a front flap decorated with the house. Inside, the figure and accessories are packed in a way I'd call moderately collector friendly. You'll still need to get past some tape and a couple twisty ties, but it doesn't require serious damage to the packaging. There's no instructions though, and something to explain the fence post and face assembly would have been good. Without it, you had to refer back to the original marketing info, since there are no photos on the box itself. There's a whopping four portraits with this figure. 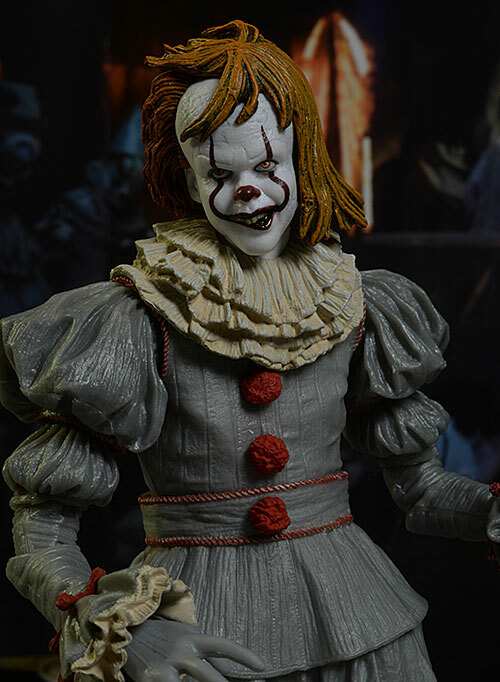 Each sports the same amazing detail we've seen with past sculpts on Pennywise, but with slight variations in evil expression. He comes wearing a wide grin, showing off those nasty teeth. This is my favorite, a very multipurpose look that's really creepy too. The detailing is fantastic, especially on the mouth. If that's not a big enough set of chompers for you, the second portrait shows off a few more rows, with a wider gaping mouth. He's in full bite-our-face-off mode here, and again, the detail work is amazing. All four heads have terrific stranding in the hair, and the skin texture is excellent for a 7" scale figure. Next up is a sloppy grin, with an angle to it, almost like he's having a stroke. Add in some wild, blowing hair, and you have a very different look for the figure. Finally, there's his wounded face. This one has a hole near the left eye and right ear, and you can slide the included fence post through these holes with a little care. This gives you a great, very scene specific look. Again, terrific detail all around. The body is exactly the same as previous releases, with great texturing on the sculpted clothes. The pom poms look great, and the various hands are sculpted to work with lots of poses. The best paint work is on the faces of course, but that doesn't mean the body has any major issues. Some parts of the costume are dirty and grimy, and there's a wash in some areas to bring out the detail. I particularly like the two piece boots, which have the majority of the detailing in the overall costume. But the faces is where the paint work really shines. The bleached white skin tone looks great, with some splotching and freckling for realism. The bloody teeth, wet tongue and lips, and red face paint are terrific, and even the eyes are sharp and neat. My only real complaint that holds him back from a perfect score in this category revolves around the aforementioned costume. 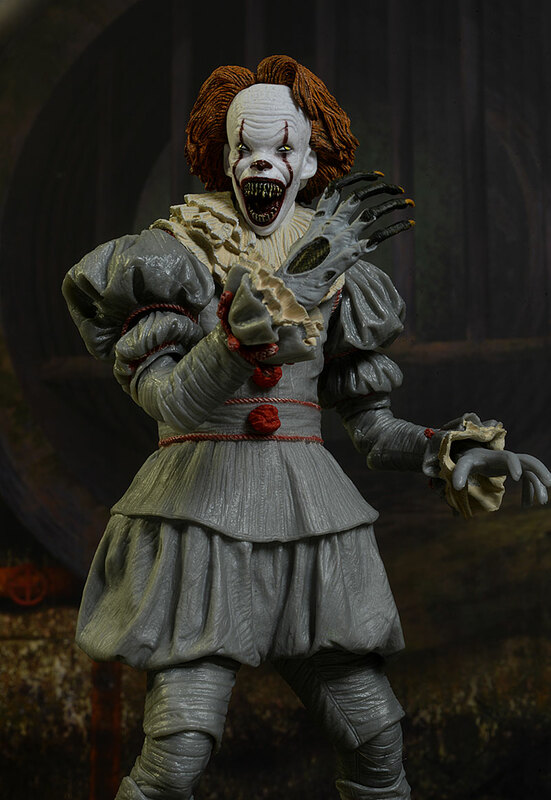 As I said, there's some wash, particularly on the ruffles, but the main suit is lacking in added paint. It looks to be cast in the basic color, which takes away a bit from the rest of the figure. Like the earlier figures, there's plenty of joints but I couldn't quite get as much natural posing out of them as I expected. The majority of these four faces have elongated jawlines, making any tilt, lean, and forward/backward movement difficult. The short neck post doesn't help. The shoulders, elbows, and wrists can do most natural arm poses, but the rolling ab joint also lacks the level of mobility I expected. The rotating hinge hips, cut thighs, double hinge knees, and rocker/hinge ankles can take short to medium stances, but I found deeper stances tough to get and maintain. On the plus side, all the hands and heads swapped easily, but remained in place when I was working with him. I already mentioned the four heads, and let's be honest - that's pretty much the sole reason for the big score in this category. Adding in three new portraits with this release makes him worth the pick up. There's a few hands as well. He has a set of open hands he comes wearing, along with a set of gripping hands that can work with some of the various earlier accessories. He also has a new 'monster' right, which is large and sculpted with claws and decaying flesh. Finally, there's that fence post I was talking about. It's from the metal fence around the house, with the spike on top. It can be inserted through the one specific head, adding a little more gruesome to an already disturbing figure. But that's it this time. 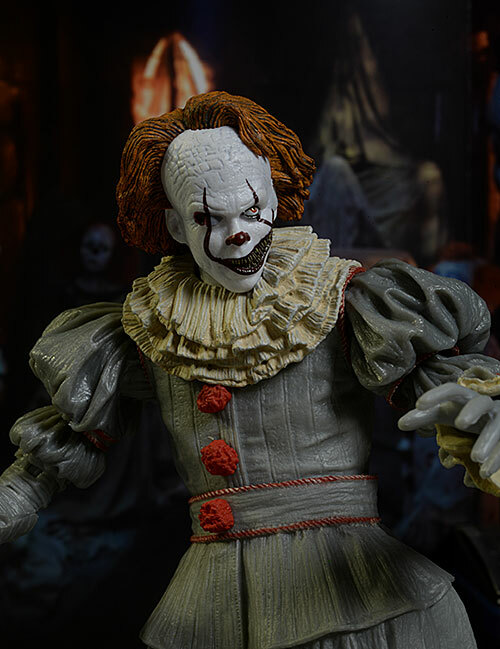 No boat, no balloons...you'll need to pick up the earlier deluxe figure to have a complete look. Add this guy in with the others, and you'll have an amazing display. He adds a bunch of additional opportunities for posing and creating dioramas, but I really wish we could get a few of the kids to go with him. At $30, you're pretty much getting what you're paying for. Most regular release figures in this scale run $20 - $25, and this guy offers quite a bit more with the multiple heads. He was *almost* a four star figure. I am a bit bummed that even with the multiple heads, we didn't get a set of balloons. That means this guy can't be your only purchase - you'll need to pick up the original deluxe as well. Still, he makes a fantastic addition, and he convinced me I needed to pick up the 'dancing' version as well. And my anticipation for the 1/6 and 1/4 scale versions is off the charts! - has him for $27. - has him at $30. - Entertainment Earth is also at $27. 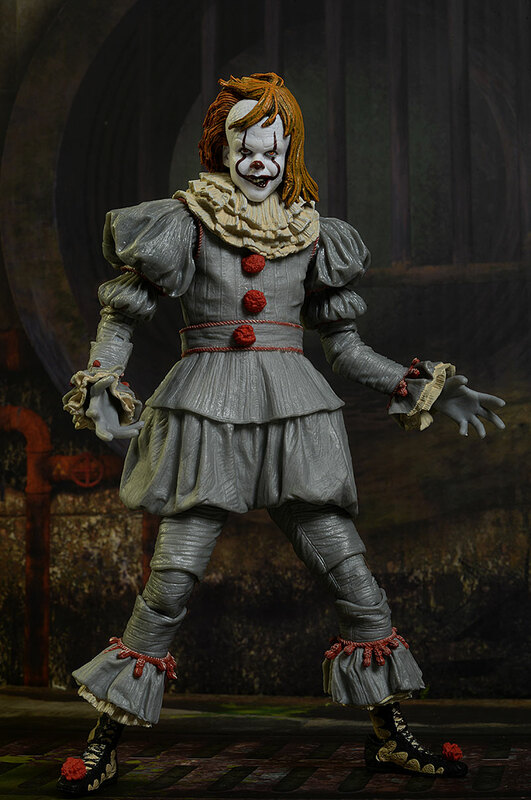 Other Pennywise figures include the exclusive, as well as the first regular release. 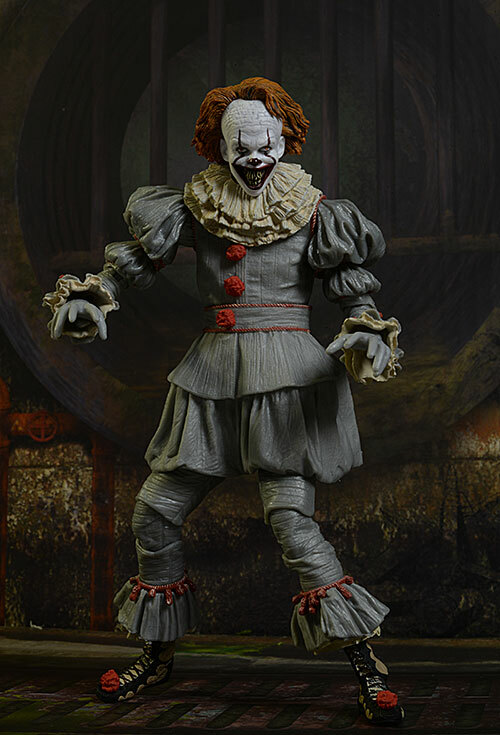 There's also the 1990 Tim Curry version from NECA.